‘You don’t get anything for free this days’ is a phrase that we’re surely all tired of hearing. As child poverty rises at an alarming rate and household debt reaches equally worrying levels, it is easy to see how low-income families resign themselves to the need to borrow when money is tight. However, there is another option for thousands of families, and it’s one that the majority of people simply don’t know exists. Trade charities and benevolent funds have been around for centuries, supporting people who have worked for professions as wide-ranging as weavers to bankers and hundreds in between. Many of these funds, like our charity, the Fashion & Textile Children’s Trust (FTCT), provide grants that can be used to buy the kind of items that people often get into debt to buy for their children. This includes school uniforms, footwear, children’s beds and bedroom furniture. If you have a child with additional needs, a trade charity may be a godsend. The Fashion & Textile Children’s Trust provides funding for mobility equipment, sensory equipment and courses of therapy, as do many others. One parent who turned to Fashion & Textile Children’s Trust for help with mobility equipment was Natalie, whose son Robin needed a new wheelchair. Natalie says: “We live in a rural area and love getting out of the house for walks. Life as a carer can be tough and the fresh air is good for all of us, especially Robin’s wellbeing. He gets anxious in crowded spaces, so countryside walks are ideal for him but we couldn’t take him out with his NHS wheelchair. Then (Natalie’s partner) Darren’s boss at Allied Textiles suggested we contact FTCT. He thought they might be able to give us a grant for Robin’s chair. With so much help available for so many from trade charities, many people think it’s too good to be true. ‘Surely we’d have already heard about these charities if they were legitimate’ they think. So why aren’t more people aware of the help available to them? The simple answer is that most trade charities are tiny. Here at the Fashion & Textile Children’s Trust, our whole organisation consists of a team of only six. Resources are stretched and, as hard as we try, we are not able to get the word out to everyone who may be eligible for our grants. Every trade charity has to come up with a name and brand that is as concise and clear as possible, while also trying to convey the breadth of professions and industries is supports – and it’s not always easy! For example, we’re called the Fashion & Textile Children’s Trust but our support spans a number of industries that you might not at first think were related to fashion or textiles at all. Anyone who has worked in any supermarket that sells a clothing range, anyone who has worked in laundry and dry cleaning, people who work in soft furnishings or a number of other professions can apply for our grants. So if you see a trade charity with a name that you don’t think means you will qualify, don’t give up immediately. It’s always worth visiting a trade charity’s website or even giving them a call to see if you qualify. You might be surprised! The answer is normally yes and we’re delighted to say that’s true of the Fashion & Textile Children’s Trust! There is no cost at any point of the process when applying for our grants and this is the case for most other trade charities. Just as you pay for the NHS through your national insurance contributions, trade charities are only available to people who have done paid work in the relevant professions – the logic being that they have contributed to that industry and have earned the right to the support. This can include self-employment (for our charity at least but others may differ). 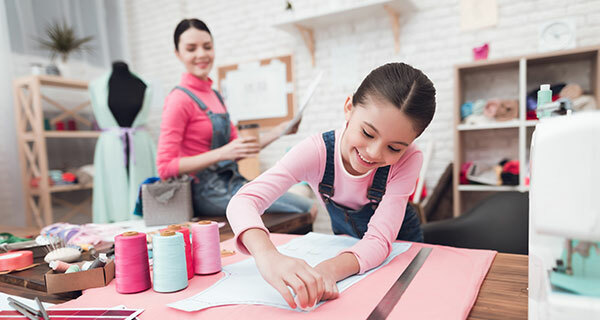 In the case of the Fashion & Textile Children’s Trust, our terms state that to apply, you have to have done paid work in a relevant profession for at least one year in the past nine years. Of course if you still work in that profession that’s fine too! However, check the individual terms of the charity you’re applying for as they can vary quite significantly. Application processes vary but most charities will always be willing to support you during the application process. Generally, it will involve making an initial inquiry (this may be online, by post or telephone) and then filling in a slightly more detailed application form. For people who are experiencing financial problems and/or ill health, we know the thought of completing a long application process can seem daunting. It can also seem daunting to collect all the necessary proof to support your application. If you are not sure about anything, it’s always best to contact the charity and see what can be done. For example, if you don’t have any P45s or P60s to prove your trade connection, you can contact HM Revenue and Customs (HMRC) and they will get back to you with proof of employment within a couple of weeks. See the Gov.UK website section Get Proof of Employment History for more information. There is no guarantee that a trade charity can help you. However, for so many people it’s an unexplored avenue that can mean the difference between getting crippling debt or not. Our advice would be to explore all funding options before taking out a loan to pay for essential items – especially if you have poor credit and face higher interest rates. In these challenging times, it’s easy to resign yourself to the least bad option in front of you. However, just because you don’t know about potentially life-changing support, it doesn’t mean it isn’t there. Read the Fashion & Textile Children's Trust profile on the Turn2us Grants Search. Next Is housing segregation pitting rich against poor?